Albert Pujols, a player pretty much considered a lock for the Hall of Fame once he retires, signed a contract with the Anaheim Angels worth $254 million over ten years (including a no-trade clause) this past week. For a few moments after I read this news, I forgot that the St. Louis Cardinals won the World Series this year. I was so stunned over the contract and the fact that Pujols left St. Louis that I didn’t make the connection that the most recognizable Cardinal was leaving the nest not even two months after getting another ring with his team. With the way the season ended for the Red Sox and then the way the off-season began, baseball is already on thin ice with me. Albert Pujols citing his feelings of being unappreciated by the Cardinals didn’t make me feel any better. I suppose I understand that in his mind the Cardinals not focussing solely on his contract negotiations and, ultimately, not giving him everything he wanted made him feel unappreciated but it’s tough to garner sympathy for someone who accepts a 10 year $254 contract with a no-trade clause telling us a nine year $210 million contract with an option for a 10th year with the team he made his name with, won two World Series with and that has such a passionate, appreciative fan base, wasn’t good enough for him. Like many other players before him, he went to the place that threw the most money (and guaranteed years) at him. With the Rays and the Yankees winning last night the screws tighten a bit more on the Red Sox this week. Of course, one good week of baseball from the Red Sox and I can stop reading the whiny tweets of the New England sports media. I have to give props to the majority of Red Sox fans I know and/or follow around the Internet: Not a lot of panicking, just a lot of frustration…which is totally understandable. I’m not here to say “There’s absolutely nothing wrong with this team” but I also think it’s premature to freak out right now, especially given the schedules for the rest of the season. The Red Sox recovered after their terrible start this year and they have time to recover right now. Reading the news last night about Manny Ramirez’s arrest on a domestic violence charge was upsetting and disappointing. The sports media will be crowing (and already started last night) today about how they told us and we should have all hated Manny based on their telling us they couldn’t tell us why but we should have hated Manny all along. There’s a fine line between being a generally lousy person and beating up on your wife. I’m not ready to give any of the Manny-haters “credit” for their feelings because they never gave us anything more than “he’s lazy and he’s selfish”. Anyone taking glee out of Manny’s failings, especially this newest one, has issues much deeper than I care to get into. Once again, Tim Wakefield is on the mound to attempt to gain his 200th win. I love Wake. I want Wake to leave the game on a high note. But right now it’s more important to me that the Red Sox get a win than it is he gets his 200th. I’d like both of those things to happen tonight but I’ll settle for just one. Photo courtesy of Kelly O'Connor and used with permission. 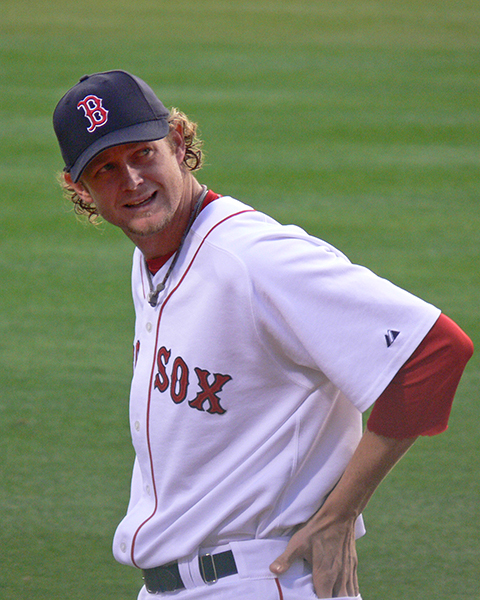 Ever since he joined the Red Sox in 2001, I defended him. From the moment he hit that first home run as a Red Sox player, on his first Opening Day at Fenway (something I witnessed in person with my father) until the day it was reported that he pushed traveling secretary Jack McCormick. On May 31st, 2008, Manny Ramirez had his last shining moment with the Red Sox when he hit his 500th career home run against the Orioles in Baltimore. I was at the game and it was magic. We cried and screamed and hugged and high-fived all around. But June 2008 was unkind to Manny fans with his fight in the dugout with Kevin Youkilis and then his altercation with Jack McCormick. He followed up June with that infamous at-bat in July at Yankee Stadium against Mariano Rivera. Those of us who revered Manny tried to ignore all the signs that he wasn’t happy and wanted to leave the team, but it was difficult to ignore the Dodger blue writing on the wall. When he was traded at the deadline I was sad but not surprised and only hopeful that Jason Bay would be accepted by the fans. For the time, Manny was dead to me. And, I’ll openly admit, I wanted him to fail miserably in Los Angeles. But time passed and I really didn’t give him much thought. Enough to know how he was doing and to be disappointed that he got that first 50-game suspension but that was about it. There’s no way I could ever forget all the wonderful moments he had in Boston so I chose to put him out of my mind and only reflect on him to visit the good times. And, regardless of what has gone on, there is no arguing that he brought us a lot of good times. I was ready for Manny to leave Boston but I wasn’t ready for him to leave baseball. I didn’t realize this until last Friday when my cell phone started blowing up with text messages and voice mails while I was at Fenway asking me if I had heard what happened. A quick glance at Twitter (man I love smart phones) and the news was in front of us: Manny was retiring because he failed a drug test and took retirement instead of the 100 game suspension MLB was going to hand down. Quite the way to celebrate Opening Day, huh? My feelings on PEDs are all over the place. I look at a player who might have skills good enough to get his foot in the door but not sustain him who isn’t a superstar and won’t ever make hundreds of millions of dollars and I feel an empathy for his trying to compete with the rest of the league. Doesn’t mean I excuse it but I sure do understand it. But Manny wasn’t that guy. I have no idea what Manny’s deal is. Was he always on PEDs? Did he start after getting a monster contract in Boston? Did he start after he left Boston and was afraid his paychecks would be dwindling? I don’t think it matters when, but I just can’t wrap my brain around it at all. And I have two distinct feelings about it that not only contradict each other but possibly everything I’ve every written about steroids or HGH…the first is that I was absolutely heartbroken and mad and after feeling like someone punched me in the gut when I heard the news, I mentally said goodbye to him. How do you support someone, if nothing else, STUPID enough to not only use banned substances but to continue using them after getting publicly humiliated by a 50-game suspension? I wanted to find Manny and kick him repeatedly for doing this. I’ve always argued when the sports writers blame the fans for the “steroid era” by saying that were complicit because we were seeing the ball get smashed around and willfully ignored the obvious fact that the players were juiced. I’ll still argue that to a degree. I still believe the majority of your average baseball fans rarely took into consideration that their favorite player was doing something illegal to up his game, but I will say this in agreement: Manny entertained the hell out of me for many years and he brought happiness to this team and the fans (both on his own and with his teammates) like Red Sox fans hadn’t seen in maybe forever. I discovered over these past few days that as disappointed as I am in what he chose to do with his body and his career, it doesn’t taint or fade those memories for me at all. Manny will always be one of the 25. He’ll also always been one of the most talented yet enigmatic players I’ve ever seen in my lifetime and I am happy that I had the opportunity to watch him in his best years here in Boston. So, yes, I’m sad and a little mad that his career is ending the way that it is…and by his own hand, make no mistake, but I’m also a bit wistful about the whole thing and I suspect with time the sadness and madness will fade and soon I’ll be able to fully appreciate him again. I hope so. I don’t like being mad at Manny. Raise your hand if you had John Lackey and Josh Beckett as the first two pitchers to get a Red Sox win. Now put your hand down because you are a liar. Where John Lackey got the win on Friday in spite of his pitching, Josh Beckett earned every bit of his “W” last night. 103 pitches over eight innings made me happy enough…but the two hits, ten strike outs and only walking one made me practically delirious. While Carl Crawford was the only Red Sox player who couldn’t get a hit off of the Yankees, Robinson Cano and Eric Chavez were the only Yankees who could hit the Red Sox last night. These are all things we should be happy about. The Red Sox came into this home stand with a record of 0-6. They were facing the New York Yankees, including their ace CC Sabathia, and needed to at least win the series if not sweep to save any kind of face. The “lowly” Red Sox who were previously swept by a powerhouse Texas Rangers team and a supposedly mediocre Cleveland Indians team got nine hits off of CC. Nine. Last night, Boone Logan was the only Yankees pitcher to take the mound who didn’t give up a run. These things, they are all good. So bask for a little longer, folks and then come back ready for another series that will probably try our patience and test our fortitude. Blog suggestion for the day: Allan over at Joy of Sox details the Clay Buchholz contract extension (which is much deserved and makes me very happy even if the timing of it is quite humorous!). Kyle Snyder in '06 - Photo courtesy of Kelly O'Connor and used with permission. I’m not one who complains about Daylight Savings; I dig it being light out at 7, 8pm. But, apparently, it has been messing with my sleep patterns because this week I have gotten up every day at least an hour later than I usually do. So, once again, my post today is late and, this time, more of just a bit of rambling than any one cohesive thought. How about some confessions that you might or might now already know about me? 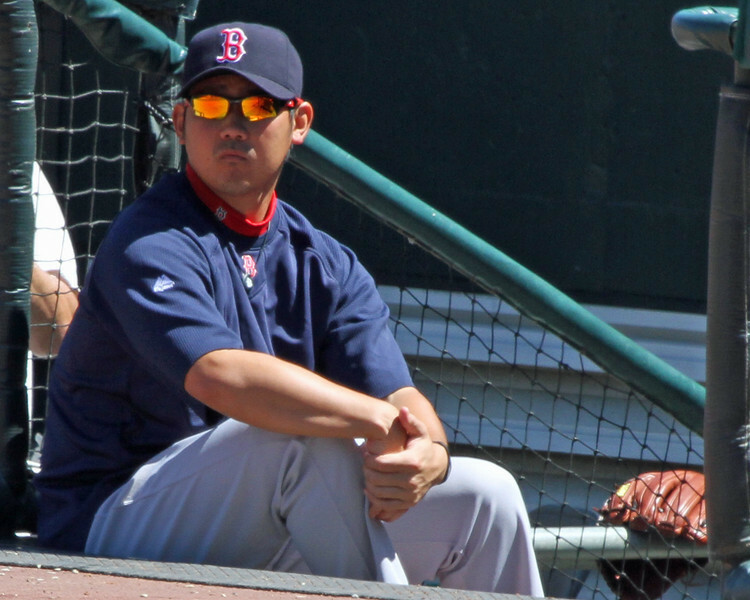 * I like Daisuke Matsuzaka. Sure it’s convenient for me to say that after he pitched so well yesterday, but I do. I’ve liked him from the beginning. I don’t fret over the money the Red Sox put out just to bid on him and I think, as far as making money in the bubble of the world known as MLB, he has been worth the money he’s being paid. * I don’t like Jon Lester. I have my reasons just like everyone has their reasons for liking or not liking a player. Having written that, if he isn’t the starting pitcher for Opening Day, I will suspect Terry Francona was dropped on his head just before making the announcement. While I could also see Tito starting Clay Buchholz and being more than happy with that, I think Crabcakes has earned getting the nod first (and next). * I’ve discovered (or maybe RE-discovered) that if I have any hard feelings for ex-Red Sox players (and goodness knows I do) they are stronger for Johnny Damon than they are for Manny Ramirez. I know the Yankees thing and the out and out lying thing are big parts of that but it struck me odd that I watched Manny and had NO feelings about how he did at bat (I felt “meh”) but just seeing Johnny holding a baseball bat my first thought was “I hope you strike out”. In real life, I’m a fairly rational person. Obviously this doesn’t translate well to my baseball fandom. +If the Red Sox trade or DFA Tim Wakefield this year, I have no idea how I will handle it. They can only trade him with his approval because of his time in the league and on the Sox, so I guess I’d be more okay with that than with them just dumping him. He’s on a different level than a “favorite” player; he’s Tim Freaking Wakefield. I can’t write any more about it because it’s upsetting me just to think about it. You will not catch me within 100 yards of Fenway Park any time the Rays are in town this year. I refuse to be a witness to the media circus/fan bashing that will go on. 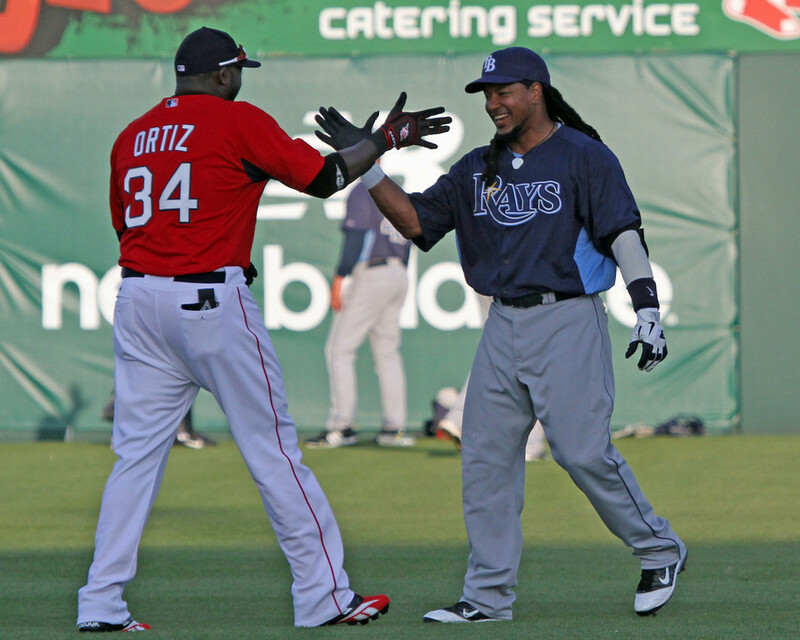 It is my hope that they both end up on the DL for every visit to Boston. I know I won’t get that lucky. Oh Dustin. I look forward to seeing this sight next year! Photo courtesy of Kelly O'Connor/sittingstill.smugmug.com and used with permission. Everything was my fault, but you have to be a real man to realize when you do wrong. It was my fault, right? I already passed that stage. I’m happy. I’m on a new team. When I went to first base, I told (Kevin) Youkilis, ‘What happened between you and me, that’s my fault. I’m sorry.’ It takes a real man to go and tell a person it was my fault and that’s what I did. While I will fully admit that my initial reaction was to focus on the “real man” lines (because, really, that’s something someone else should say about you not something you should tell folks about yourself: “Look at me! I’m a REAL man now!”) the truth is, I’m still a little stunned. When I checked the Droid last night and read the headline “Manny apologizes for his exit from Boston” I was convinced it was a joke. It certainly doesn’t make up for what he did (or, really, what he said after he left) but it’s so much more than I ever expected from him. It’s interesting to think that Manny is starting to focus on what his legacy will be once he isn’t playing ball and is trying to do some kissing and making up. Doesn’t change a lot for me but I think it will make a huge difference to a lot of fans. Johnny Damon could take some lessons in fan relations from Manny (holy cow did I just type that?). In regard to a player I’d much rather write about, Dustin Pedroia bit the bullet yesterday and had season-ending surgery on his foot. This makes two infielders and two outfielders who were starters not being able to play the season (Youkilis, Ellsbury and Cameron round out the group). I’m sorry, I know folks don’t like pointing to injuries and saying they are the reason for a bad season but THINK about how many injuries to key players this team has withstood this season and think about the fact that the Sox still are actually in the playoff hunt (it’s a long shot, I get it, but they’re still in it technically and in a much better position than they really should be given what tremendous hits they’ve taken in 2010). I’ll definitely miss the 1pm game today and possibly will miss the 7pm game. Yanks and Rays both won last night so the road hasn’t gotten any easier. Still, I have hope. How about you? Daniel Nava, currently batting .370 with 7 rbi in 8 games. Photo courtesy of Kelly O'Connor/sittingstill.net and used with permission. Sweeps make me happy, especially when the majority of them happen on national television. As much as Fox and ESPN tried to make it about Manny Ramirez (and Lord knows ESPN, with a little help from Curt Schilling, went annoyingly out of their way to make it about Manny) it was all about the Red Sox this weekend. Manny’s reappearance at Fenway threatened to take the attention away from the recent great play of the Red Sox. This is why ESPN and Fox stole the games away from NESN this weekend and while they most likely brought in the desired ratings, there had to be disappointment that there wasn’t more booing, there were no “Manny being Manny” antics and, especially, that Manny didn’t bring the Red Sox down. Red Sox fans who showed up at Fenway planning to cheer for Manny and hoping to see him do well got a few hits, a home run and even a stolen base. Those who wanted him to go down saw him strike out against Scott Atchison. The weekend was a win-win for all Red Sox fans! Clay Buchholz now has 10 wins under his belt and the Red Sox head to Colorado riding a six-game winning streak (and two series sweeps). The Sox are tied for 2nd place with the Rays, only a game out of first place. Tomorrow night the Sox begin their west coast trip to finish off interleague play for the season with Jon Lester on the mound. The baseball gods are being a little bit generous this week, as all of the Rockies games begin at 8:40pm ET – which means it won’t be as painful to do the Tuesday night live chat as I had anticipated. Which means we’ll be here tomorrow night live chatting it up! I don’t regret my decision to not be at Fenway this weekend. Manny came and went and the Sox are sitting pretty with another 3 games in the wins column. I received an email from someone identifying as a Dodgers fan last night that read: “Sox still missing Manny! Enjoy failure without him!”. I’m not sure how this weekend equals failure for the Sox or their fans…but if this is failure, I’ll take some more please. He made his way to home plate, the ballpark roiled with sound, a nearly equal amount of cheers and boos greeting him in his return to his former home. I wasn’t at the game. Hell, I didn’t start watching the game until it was halfway over (thank you dvr!). What I heard and saw via NESN was an almost exact amount of cheering and booing with a few people not doing either. NESN doesn’t always pick up all the noise at Fenway so I was hoping for the writers to give us a good account of what happened. I know that, when you’re sitting at Fenway, the noise is different for everyone. There have been nights there where I’ve heard booing and people I know who were in different parts of the park didn’t hear anything or where I was embarrassed by booing and when discussing it with friends was told they couldn’t hear it on NESN. So it IS difficult to gauge the noise in Fenway sometimes. But two people presumably sitting side by side giving slightly different accounts of what happened last night leads me to believe some folks will just write what they want, reality be damned. We went into this knowing that the fans had mixed feelings about Manny coming back and I think the crowd reflected that well. (I welcome folks who were actually there and don’t need to change the truth to fit their narrative to let me know if I’m wrong. I trust the fans much more than the writers when it comes to this subject.) I realized last night that the fans needed to do what they needed to do. I’m not embarrassed by those fans who booed because Manny got his cheers by the boatful while he was in Boston. While I’ve already written how I feel it’s a mistake to judge Manny’s time with the Red Sox solely based on what happened in 2008, I also think it’s acceptable to remember that Manny wasn’t exactly forced out of this town. A good friend who is much less judgmental of things like this than I said to me the other day “I don’t hate Manny and I’d probably never boo him but cheering him feels like rewarding him for bad behavior”. That’s not so crazy to me because, regardless of the 2004 and 2007 Championships, much of his behavior in 2008 was “bad”. Fine for the players to forgive and forget (after all, they got Jason Bay in their clubhouse in the exchange and things worked out pretty well with him around) but I can’t fault the fans who felt like this was their one true chance to make their own voices heard without them being filtered by the media. Today’s and tomorrow’s games are both nationally televised. The Fox team has a history of giving Manny a hard time and the ESPN team has always been more understanding of “Manny being Manny”. It will be interesting to hear how each broadcasting team reacts to Manny and to the reactions of the fans. And now, unless he punches someone on the field or does something truly noteworthy this weekend, I’m pretty sure I’m done writing about Manny for a while. You can put your hand down, Felix, you've been chosen! Photo courtesy of Kelly O'Connor/sittingstill.net and used with permission. The last two days have been fabulous baseball days. While the Red Sox were sweeping the Arizona Diamondbacks, the Braves and Phillies were taking it to the Rays and Yankees. This morning, with both the Rays and Yanks losing their series, the Red Sox sit two games out of first place. Two games. All of you who called the season over in early May can go jump in a lake now, thank you. Daniel Nava has 18 major league at-bats and is hitting .444 with a .474 OBP and a slugging percentage of .833. His OPS is 1.307 and he has six RBI, four doubles and a home run under his belt. THIS is the way you make your major league debut. Tonight, Red Sox fans get to enjoy another MLB debut, that of starting pitcher Felix Doubront. Felix is a 22 year-old, left-handed pitcher from Venezuela who has been in the Red Sox organization since he was 17 years old. He started this season in Double A Portland and worked his way up from Pawtucket to Boston tonight. Much luck being sent out Felix’ way and here’s hoping he gets a K or two against Manny Ramirez! This season hasn’t been easy on the Sox. Currently they’re playing without two of their three starting outfielders (well, Cameron is back but, really only part-time) and without two of their five starting pitchers. For them to be in the position they’re in (two games out of first…have I mentioned that?) with all they’ve had to deal with is a testament to their talent and will. If they can be successful with their starters hurting and bringing in some young blood that makes it all the more enjoyable to watch them. I am full of mixed emotions over Manny’s return tonight. There is no doubt I want him to fail but I am still not comfortable with the idea of booing him. I’m also extremely uncomfortable with his getting an ovation the likes of Pedro Martinez or Nomar Garciaparra. I wish for silence but know that won’t happen either. All I really know is that I want this weekend to be over quickly and I want the Red Sox to sweep the damn Dodgers.